So, I’m wide awake, it’s 6:30 in the morning and I realize that I forgot to upload the promised “Quilted” Ornaments instructions. These ornaments make up quickly although cutting all the squares does take some time. However, if you have a rotary cutter, they’ll go much faster. You can find similar instructions around the web, but I’m going to give you special permissions for my version. You cannot sell the instructions, printed or electronic. 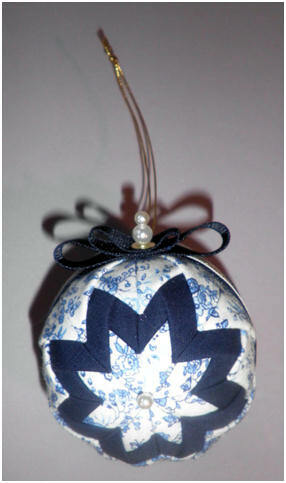 You can make the ornaments and sell or give them away. You can make up kits and sell them, but the printed instructions must be given free, i.e., free instructions with purchase of kit. Adding the silk pins will increase your cost for the kit, but you can also offer a cheaper version without the pins. You can get sets of pins at your local craft store that are in a nice plastic container. The silk pins usually come in a set of 200 pins so I usually buy extra boxes, take off the cardboard hanger and add 20-30 pins to each box for a kit. When I made up kits, I would make sure to cut extra fabric squares and cut each one into fourths that I would attach to the outside of the kit so my customers could choose their color combinations. Write the kit name on the outside of the lunch bag (alternately, write it on a gummed label and attach the label). Place the fabric, ribbons, and cord into the plastic bag and seal, place into the paper bag. Add the corsage pins, beads, and sequins to the box of silk pins. Place the pin container and styrofoam ball into bag. Fold top of bag over a couple of times, place the small squares of fabric that match the kit fabric on the folded part of the bag and staple closed. You’re now ready to make your own ornaments or whatever! Click on the PDF icon below to download the file.